A few weeks ago, my coworker Purr was telling me that she wanted to get some vermicompost (composted worm poop). 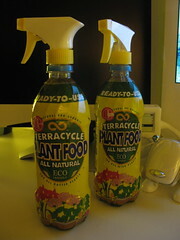 Last night, I decided to really read the label of an eco-friendly plant food called Terracycle, that I bought about a month ago. To my surprise, it is made of vermicomposted organic matter. In other word it’s like Worm Poop Tea that you spray on the plant’s foliage or water it into the soil. One thing that attracted me to this product is that they reuse old soda bottles. That’s why some look like Coke bottles and others Pepsi or Aquafina. I decided to surprise Purr and get her a bottle to try. As I was looking for it, I saw some Lithops, which were some succulents that I’ve always wanted, so I bought two 2-inch pots. Hmm, maybe this is a start of another collection. 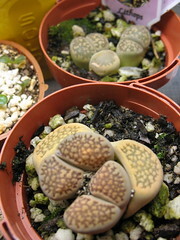 This entry was posted in Uncategorized and tagged lithops, purchase, succulents, terracycle. Bookmark the permalink.